වෙනත් භාවිතා සඳහා, නස්රදින් (වක්‍රෝක්තිහරණය) බලන්න. According to an unproven claim, the legendary Nasreddin lived in Anatolia; he was born in Hortu Village in Sivrihisar, Eskişehir in the 13th century, then settled in Akşehir, and later in Konya, where he died. The "International Nasreddin Hodja Festival" is held annually in Akşehir between July 5-10. As generations went by, new stories were added, others were modified, and the character and his tales spread to other regions. The themes in the tales have become part of the folklore of a number of nations' and express the national imaginations of a variety of cultures. Although most of them depict Nasreddin in an early small-village setting, the tales (like Aesop's fables) deal with concepts that have a certain timelessness. They purvey a pithy folk wisdom that triumphs over all trials and tribulations. Today, Nasreddin stories are told in a wide variety of regions, and have been translated into many languages. Some regions independently developed a character similar to Nasreddin, and the stories have become part of a larger whole. In many regions, Nasreddin is a major part of the culture, and is quoted or alluded to frequently in daily life. Since there are thousands of different Nasreddin stories, one can be found to fit almost any occasion. Nasreddin often appears as a whimsical character of a large Albanian, Arab, Azeri, Bengali, Bosnian, Hindi, Pashto, Persian, Serbian, Turkish and Urdu folk tradition of vignettes, not entirely different from zen koans. He is also very popular in Greece for his wisdom and his judgment[තහවුරු කරන්න]; he is also known in Bulgaria, although in a different role, see below. The Nasreddin stories are known throughout the Middle East and have touched cultures around the world. Superficially, most of the Nasreddin stories may be told as jokes or humorous anecdotes. They are told and retold endlessly in the teahouses and caravanserais of Asia and can be heard in homes and on the radio. But it is inherent in a Nasreddin story that it may be understood at many levels. There is the joke, followed by a moral – and usually the little extra which brings the consciousness of the potential mystic a little further on the way to realization. The anecdotes attributed to him reveal a satirical personality with a biting tongue that he was not afraid to use even against the most tyrannical rulers of his time. He is the symbol of Middle-Eastern satirical comedy and the rebellious feelings of people against the dynasties that once ruled this part of the world. Some mystic traditions use jokes, stories and poetry to express certain ideas, allowing the bypassing of the normal discriminative thought patterns. The rationality that confines and objectifies the thinking process is the opposite to the intuitive, gestalt mentality that the mystic is attempting to engage, enter and retain. By developing a series of impacts that reinforce certain key ideas, the rational mind is occupied with a surface meaning whilst other concepts are introduced. Thus paradox, unexpectedness, and alternatives to convention are all expressed. Although there are several books that attempt to put together the many jokes attributed to him, most people encounter his jokes in the context of their daily lives. Often, a Nasreddin joke is told by one party when the other party makes the kind of mistake that Nasreddin had parodied. Some tales of Nasreddin are also adapted and used as teaching stories by followers of Sufism. This is such a common practice that, given the nature of many of Nasreddin's jokes, multiple interpretations (or several 'layers' of meaning) are to be expected. Idries Shah, a well-known Sufi and writer, published a number of collections of Nasreddin stories (see list below), and suggested that the stories' various layers of meaning have a teaching-effect. In some Bulgarian folklore tales that originated during the Ottoman, the name appears as an antagonist to a local wise man, named Hitar Petar (Хитър Петър, meaning "cunning Peter"). In Sicily the same tales involve a man named Giufà. While Nasreddin is mostly known as a character from anecdotes, whole novels and stories have later been written and an animated feature film was almost made. The oldest manuscript of Nasreddin was found in 1571. In Europe, Nasreddin can be compared with the German 14th century figure Till Eulenspiegel, published in 1510. The Russian composer Shostakovich celebrates Nasreddin, among other figures, in the second movement (Yumor, 'Humor') of his Symphony No. 13. The text, by Yevgeny Yevtushenko, portrays humor as a weapon against dictatorship and tyranny. Shostakovich's music shares many of the 'foolish yet profound' qualities of Nasreddin's sayings listed above. Once, Nasreddin was invited to deliver a khutba. When he got on the minbar (pulpit), he asked "Do you know what I am going to say?" The audience replied "NO", so he announced "I have no desire to speak to people who don't even know what I will be talking about" and he left. The people felt embarrassed and called him back again the next day. This time when he asked the same question, the people replied "YES". So Nasreddin said, "Well, since you already know what I am going to say, I won't waste any more of your time" and he left. Now the people were really perplexed. They decided to try one more time and once again invited the Mullah to speak the following week. Once again he asked the same question - "Do you know what I am going to say?" Now the people were prepared and so half of them answered "YES" while the other half replied "NO". So Nasreddin said "The half who know what I am going to say, tell it to the other half" and he left! - "Hey! how do I get across?" - "You are across!" Nasreddin shouted back. A neighbour comes to the gate of Mula Nasreddin's yard. The Mulla goes out to meet him outside. "Would you mind, Mulla," the neighbour asks, "lending me your donkey today? I have some goods to transport to the next town." "I'm sorry, but I've already lent him to somebody else." "You lied to me, Mulla!" the neighbour exclaims. "There it is behind that wall!" "What do you mean?" the Mulla replies indignantly. "Whom would you rather believe, a donkey or your Mulla?" The stories of Mulla Nasreddin are in many languages. They are popular all over the world. In honor of Mulla Nasreddin, UNESCO (http://portal.unesco.org/) decided to call the year 1996-1997 International Nasreddin Year. 600 Mulla Nasreddin Tales, collected by Mohammad Ramazani (Popular Persian Text Series: 1) (in Persian). 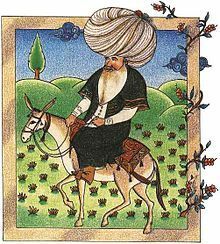 Nasreddin's name is also commonly spelled Nasrudin, Nasr ud-Din, Nasredin, Naseeruddin, Nasruddin, Nasr Eddin, Nastradhin, Nasreddine, Nastratin, Nusrettin, Nasrettin and Nastradin (lit. : Victory of the Deen). His name is sometime preceded or followed by a title of wisdom used in the corresponding cultures: "Hoxha", "Khwaje", "Hodja", "Hojja","Hodscha", "Hodža", "Hoca", "Hogea", "Hodza". In Arabic speaking countries this character is known as "Djoha", "Djuha", "Dschuha", "Giufà", "Chotzas", "Mullah", "Mulla", "Molla", "Maulana", "Efendi", "Ependi". For these, see Hajji, Mullah and Effendi (In several cultures his name is just the title). In the Swahili culture many of his stories are being told under the name of "Abunuwasi". ↑ Idries Shah, The Exploits of the Incomparable Mulla Nasrudin / The Subtleties of the Inimitable Mulla Nasrudin, Octagon Press (2003), p. ix, ISBN-13: 978-0863040863. ↑ 2.0 2.1 2.2 The outrageous Wisdom of Nasruddin, Mullah Nasruddin, (LINK); accessed February 19, 2007. ↑ 4.0 4.1 Mulla Nasruddin, (LINK); accessed February 20, 2007. ↑ "NASRETTİN HOCA". Republic of Turkey Ministry of Culture and Tourism. සම්ප්‍රවේශය 2006-12-28. ↑ 7.0 7.1 Fiorentini, Gianpaolo (2004). "Nasreddin, una biografia possibile". Storie di Nasreddin. Torino: Libreria Editrice Psiche. ISBN 88-85142-71-0. http://www.psiche.info/estratti/psiche/StorieDiNasreddin.htm. Retrieved 2006-12-28. මේ පිටුව අන්තිමට සැකසුවේ 12 නොවැම්බර් 2013 දින දී, 21:59 වේලාවෙහිදීය.